As reported by Jane's IHS, MilTechMag and DefenseNews.com, the offers for the Challenger 2 Life Extension Programme (LEP) have been submitted by the industry to the British Army. The Challenger 2 LEP aims at upgrading the Challenger 2 main battle tank (MBT) to a more modern standard, so that it is competitive in the year 2025 and beyond (currently the CR2 is expected to remain in service until at least 2035). The official name for this project is "Armour (MBT) 2025". Meanwhile Germany and France are developing a next generation tank with a 130 mm tank gun and keep upgrading their existing Leopard 2 and Leclerc MBTs. Originally a total of seven major American and European defence companies have answered the British request for upgrade proposals for the CR2. However the US-based General Dynamics (the manufacturer of the current M1 Abrams MBT) has decided to join the Team Challenger 2 lead by BAE Systems. 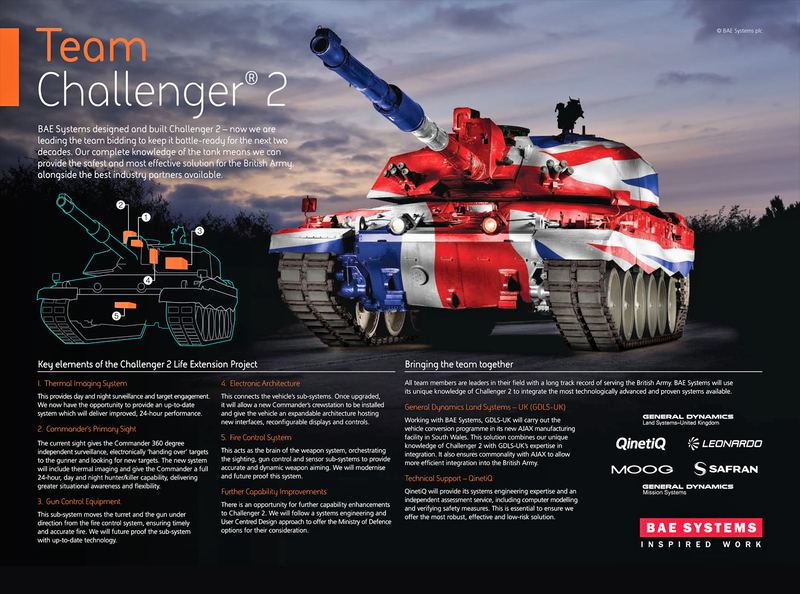 BAE Systems acquired Vickers Defence Systems, the manufacturer of the Challenger 2 tank. The British MoD is planning to shortlist two bidders in 2016. On request of one unnamed bidder, the deadline for submitting the proposal has been moved by one month and the program was thus delayed. With the delay, the tender response date was moved the 11th August, after this the two most promising bids will be selected in the next weeks. Two contracts of £19 million (€22 million) are expected to be signed with the favoured bidders by end of October. In total the contract for upgrading of up to 227 CR2 tanks is expected to have a worth of up to £624 million (currently €722 million). In a different contract the UK Ministry of Defence (MoD) has decided to let QinetiQ evaluate the German MUSS softkill active protection system (APS) for integration into the Challenger 2 tank and other British fighting vehicles. A decision to adopt a softkill APS on the Challenger 2 is scheduled for April 2018. The German company Rheinmetall has made a few aspects of their initial upgrade proposal known in a press release. The company suggest not only replacing outdated components, but also enhance the tank's capabilities further. Upgrades to mobility and protection are further options. Rheinmetall has partnered with the British companies Supacat, Thales UK and BMT. The press release included a rendering of an upgraded Challenger 2 tank. 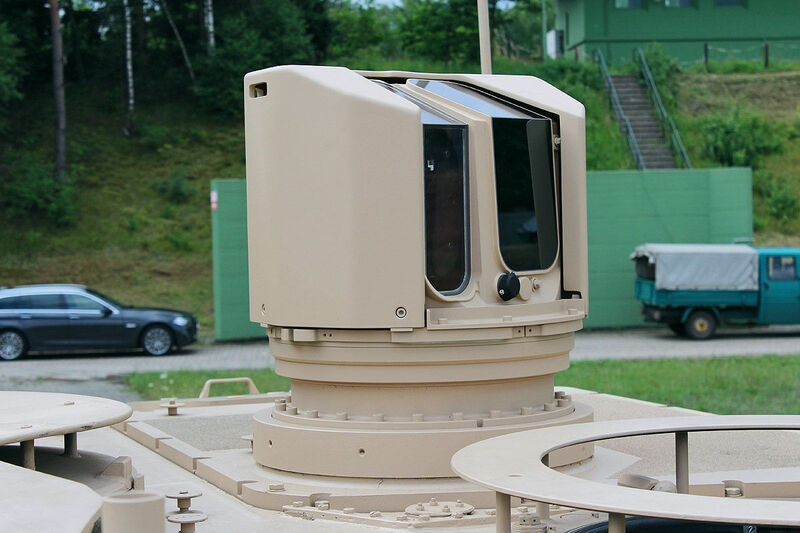 The commander's main sight has been replaced by the Seoss stabilized electro-optical sighting system from Rheinmetall. This stabilized optronics include a dual-axis stabilized sensor head with a third generation SAPHIR thermal imager, a laser-rangefinder and a high resolution CCD camera. It is also fitted with an integrated fire control system. The Seoss sight enables a high accuracy even when the tank is moving against static and moving targets. The same sight system has been used on the MBT Revolution/Advanced Technology Demonstrator and on the Boxer CRV. It can be fitted with the Main Sensor Slaved Armament (MSSA) remote weapon station. It is not clear if the gunner's primary sight has also been replaced with a version of the Seoss sight or the original Gunner's Primary Sight (GPS) from Pilkington Optronics (nowadays part of Thales UK) has been kept. The rendering still shows a distinctive box ontop of the gun mantlet, which used to house the Thermal Observation and Gunnery Sight 2 (TOGS-2) on the original Challenger 2. 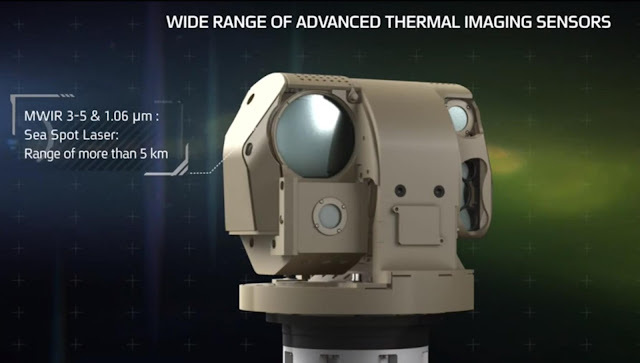 This might imply that the TOGS-2 thermal sight was kept or upgraded, instead of being replaced by a single sight unit with integrated thermal imager. The rendering however does not show a flap in the armored box; it is not known wether this is result of the 3D model being poor or the TOGS-2 was actually replaced. One single unit of Rheinmetall's Situational Awareness System (SAS) can be seen ontop of the turret. Most likely there are two or more SAS units, enough to provide a full 360° sensor coverage. 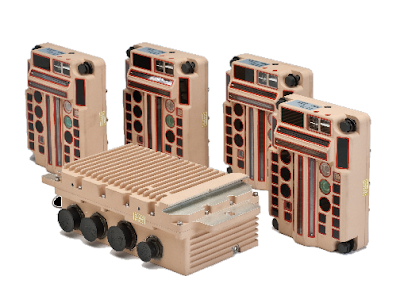 Each unit contains three high definition sights (either day sight CCD cameras or uncooled thermal imagers), each set at 45° angle apart of eachother. Two SAS modules are required to provide a full 360° coverage of the surroundings either at day or night, four for a 360° sensor coverage with cameras and thermal imagers at the same time. The system is designed for easy integration in existing system thanks to an open architecture. It also features an automated warning system, which can be triggered by moving objects when enabled. Optional features of the SAS include automated mission recording, tracking and tracing, a sniper warning system (not installed in the rendering), laser warners (apparently installed) and the integration of SAS into existing fire control and battlefield management systems. Rheinmetall also offers the replacement of the outdated rifled Royal Ordnance L30 gun with it's current L/55 smoothbore gun with enhanced armor penetration. This gun would also enable the tank to fire programmable ammunition. Lockheed Martin UK has partnered with the Israeli company Elbit Systems for the Challenger 2 LEP. According to DefenseNews, this partnership was established just 24 hours before the deadline for the industry proposals. This is probably the result of Lockheed Martin's partner for upgrading the Warrior MICV, Thales UK, partnering with Rheinmetall. Given that Lockheed Martin's own technological portfolio, as previously noted, is the smallest of all bidding companies, they were forced to find a new partner. Most likely the proposal from LM and Elbit will include the replacement of the sights with new models made by Elbit Systems. Most likely the commander's sight will be replaced by the Commander Open Architecture Panoramic Sight (COAPS) sight used on the Sentinel II and the TAM upgrade. This dual-axis stabilized sight includes a day sight CCD camera, a laser rangefinder and a latest generation thermal imager. 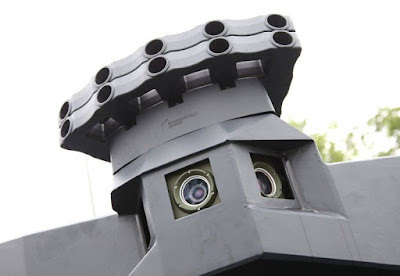 The Pilkington Optronics Gunner's Primary Sight might be replaced with a similar device from Elbit Systems, possibly incorporating a thermal imager and thus allowing the removal of the gun-mounted TOGS-2 sight. Possible upgrade options include the Knight FCS (Elbit's FCS developed for the Merkava tanks) aswell as the Thermal Imaging Fire Control System (TIFCS), which Elbit developed as an upgrade option for existing vehicles. Given that the last two international land vehicle projects from Elbit Systems included the adoption of a laser warning system, the Challenger 2 LEP proposal from Lockheed Martin UK and Elbit might aswell include the adoption of this system. Earlier already CMI Defence announced their cooperation with the British company Ricardo UK. While CMI has experience with the manufacturing and upgrading of turret systems, Ricardo is one of the leading British companies in automotive and systems engineering. It is understood that this results in a separation of tasks: CMI Defence is responsible for upgrading the turret, while the hull is being upgraded by Ricardo UK. The latter company has been working with the Defence Science and Technology Laboratory (DSTL) of the British Ministry of Defence on optimizing the drive- and powertrain of the Challenger 2 as part of obsolecence management studies. Ricardo has developed a tool set for accessing the effectiveness and costs of upgrades. Not much details about CMI Defence's and Ricardo's proposal are known. It might include the adoption of the RUAG-designed Compact Tank Gun (CTG), for which CMI Defence has acquired a licence; however exact details on this licence are unkown and RUAG may be the only company offering said gun for the CR2 upgrade. CMI press releases for earlier products speak of a 120 mm smoothbore Cockerill high-pressure gun; if this is the name for the licence-made CTG or refering to another product has to be clarified. Most likely the two companies will suggest replacing the sights and electronics, while also adding a new APU or upgrading the powerpack or drivetrain of the tank. CMI Defence has used optronics from different companies for their medium and large calibre turrets, but some of their latest products utilize sights from French manufacturer Safran. However Safran is cooperating with BAE Systems. 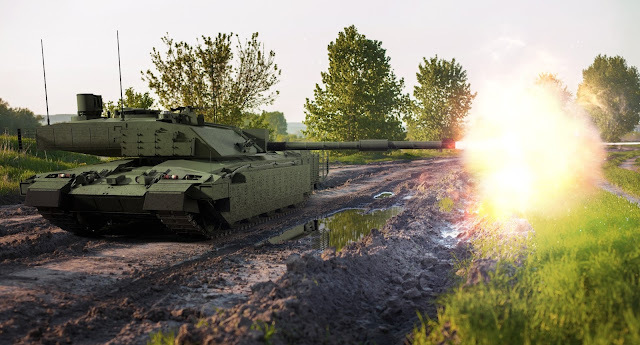 General Dynamics and BAE Systems have formed Team Challenger 2, while RUAG announced to cooperate with a group of UK-based industrial partners. The German company Krauss-Maffei Wegmann (KMW), the Leopard 2 manufacturer, has released no details of their upgrade proposal to the public yet, but it appears likely that KMW will rely on optronics supplied by Airbus Defence and Space (formerly Cassidian), which were also used on the current iterations of the Leopard 2 MBT and the Puma infantry fighting vehicle (IFV). Given the BREXIT, there still should be a big question mark wether the Challenger 2 Life Extension Programme will be futile. The negative impact on the UK economy is currently undeniable, despite the actual BREXIT still being a problem for the future. The British Army is already running other expensive modernization programs such as the procurement of the Scout SV (including the turreted AJAX variant), which is heavily relying on technology and components supplied by EU-based companies, and is also looking to acquire an 8x8 wheeled mechanized infantry vehicle (MIV). Pretty much all candidates rumored for the MIV are European products, which will be more likely affected by the BREXIT than other military procurements.